The following page outlines the developmental history of iSoaker.com and gives some insight into why things were done, how they were done, and perhaps where things will be going from here. 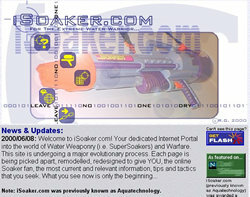 (Visit the June 17, 2000 version here) The year 2000 soaking season found SuperSoaker.com supporting (at least, in part) Aquatica Club's efforts in creating the best online Super Soaker® support group. The time was right for change. 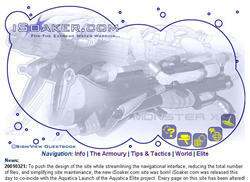 As such, Aquatechnology was renamed under its newly acquired URL and became known as iSoaker.com - For The Extreme Water Warrior... The motto, "Leave NO one dry! ", remains from the days of Aquatechnology, but the rest of the site had begun the metamorphosis to mark the new beginning. 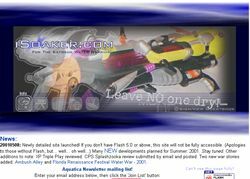 (Visit the year 2000 version here) Off-season means the end of out-door blaster use and general hibernation of most online Super Soaker® websites. iSoaker.com is no exception to this rule. However, lower frequency of updates allows much grander changes to occur site-wide. 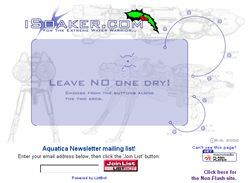 To shed most of the old Aquatechnology styling, the iSoaker.com website had undergone through more alterations. Basic navigation icons remain, but various pages and sections were condensed and their layouts altered. New sections and features have been added as well including a Soaker World News section which is different from the general news and updates. As well, an iSoaker Forum using Yahoo! clubs was created for online discussions concerning anything iSoaker.com related. The end result is a more stylish, more functional, and, hopefully, simpler to navigate website. Shedding old site designs, iSoaker.com has taken the off-line opportunity to transform its general graphics interface with a cleaner, tech-like feel. Even the iSoaker.com logo has gotten a facelift. The largest change to the website is the inclusion of Flash-free version for those whose systems cannot handle the new Flash movies. While the non-Flash version of the site will be maintained, it will not contain all the sections or benefits that the Flash-based version has. In the Flash-based site, the main navigation menus now employ submenu-loading, allowing visitors to navigate from any page to virtually any other page in the site. The use of Flash movies to load sub-movies allows for nicer page-transitions, less amounts of file loading, and smoother navigation overall. Menu design was also continued throughout the site with inner-menus featuring the same dot-button/arc styling. Even the titlebar which adorns the top of every page allows the visitor to jump to virtually every page on the iSoaker.com site (Flash site, that is). In the non-Flash site, the menus, submenus, and most of the detailed blaster review Flash movies were converted into text and graphics. However, many other Flash movies were simply removed since they could not be easily converted into simply graphics and text. However, preservation of the the overall new graphical feel of iSoaker.com was attempted though it requires a few more steps to get from page to page. In addition to the two versions of the iSoaker.com website, the iSoaker.com image gallery section was also launched, containing images free for personal, non-commercial use. 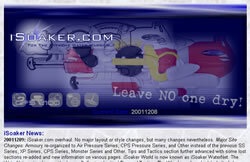 Perhaps one of iSoaker.com's greatest kudos is the picture given to iSoaker.com of Lonnie Johnson, the inventor of the Super Soaker, from Mr. Johnson's company, Johnson R & D with approval for use on iSoaker.com by Larami Ltd. In response to this honour, the Super Soaker History page was expanded with more background information about the invention of the Super Soaker. All these changes and additions resulted in an larger overall website while making browsing even faster and simpler for everyone. Simply done to smoothen out some of the rough edges and experiment with various Flash commands, an upgraded version of iSoaker.com was launched in March, 2001. Flash-movies for the various blaster reviews were modified to include pop-up windows and main submenus were increased in size to spread out the menu-items on the screen. As well, the iSoaker Exchange section was removed due to lack of activity and its position in the menu was replaced with the iSoaker Elite section. However, this 2001 upgrade was minimized since it was felt that these changes would not yield the desired end-result. As such, the upgrade was posted earlier than expected while a much larger change to the site was begun off-line. The early-March released version of iSoaker did not achieve or appear to be improving on the pre-existing design by much. At the same time, the way the site was previously constructed meant that at least two pages would need to be updated in order for one section to be complete since there were separate Flash-based and non-Flash-based sections. The first thing done for the new site was a recombining of the two parts to make updating simpler. However, text-based links were put on every page so that the entire site would be navigateable even without the Flash 5.0 player. Of course, it is still a much better viewing experience for those with browsers that support Flash 5.0 movies. Extraneous Flash movies were converted into still graphics while key Flash movies were upgraded. More stylized collage-artwork now decorates the main page and many submenus. The "arc" theme for the main pages has also been abandoned infavour of the droplet/splatter theme. Also, much of the actual text-content has been reworked and reorganized. The Elite section now pushes Aquatica's newest on-going development, the Aquatica Elite. The overall changes throughout the site are, in my opinion, even more extensive than in the Winter, 2000 update. The site was released to greet the 2001 Spring Season here in Canada. (Visit the iSoaker.com 2001 site here) After debating, then debating further, then thinking hard once last time, it was decided that choosing to support both Flash and non-Flash browsers properly would be too much work for a lone site- operator. Since getting a second operator is currently out of the question, it was the non-Flash browsers that are being left unable to fully view the site fully. Based on statistics reports generated by iSoaker.com's host servers, it appears that most visitors do have Flash. Hopefully, those that don't have Flash will be understanding and, perhaps, will choose to install Flash 5.0 so they, too, can view the site for what it is meant to look like. Other than some general cosmetic changes and a top-Flash menu linking system that works more to my liking, this update merely marks the change of attitude and styling of the pages in iSoaker.com. A lot of new developments are planned for the summer of 2001, but only time will tell how these plans unfold. To prepare for the 2002 soaking season, several aspects of iSoaker.com were updated and upgraded. While the overall styling of iSoaker.com remained basically unchanged, minor tweaks were done to various graphical elements to make them even smoother and sleeker than before. The Armoury section of iSoaker.com was reorganized, combining blasters by general technology (i.e. air-pressure vs. CPS-chamber pressure) instead of by previous blaster designations. The blaster timeline was put back up. The Tips and Tactics section was tweaked with more additions planned for 2002. The iSoaker World section was renamed as iSoaker WaterNet. The change of designation was to reflect that slightly altered purpose of that section. While being the main section where submitted materials would be posted, WaterNet also has a links-hub as well as a Yahoo! Group under its banner. The links hub is intended to promote good water warfare websites that choose to participate in the WaterNet goals of better information and better communication. The WaterNet Yahoo! Group provides an open forum for water blaster and water weapon discussion as well as serving as a trial ground for potential new iSoaker Rogue members. iSoaker Rogue membership application has been altered and potential members must be a member of the WaterNet Yahoo! Group for at least one month before they will be considered for joining the Rogue group. The 2002 season will undoubtedly be an interesting one. Only time will tell what lies in store.